Hiroshima University Student Vox Pop. No.39 There is more than one way to pursue your interest. Challenge and open a new door for the future. “HU Student Interview Series” gives our prospective students an insight into the perspective of HU students. On the 39th interview in this series, we interviewed Ms. Momoka Mastukura who graduated Saga Seiwa Gakuen, Saga Seiwa High School and is currently in the 4th year of the Department of Law, School of Law. 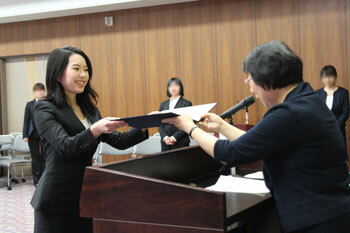 Ms. Matsukura has an unique background that she attended to two schools at the same time before transferring to Hiroshima University. We asked her about the reason why she applied for Transfer Admission, her university entrance exam preparation days, and her campus life. Applying for a public university in Kyushu as the first try. I studied hard while taking one-on-one instruction in each subject. I was interested in criminal psychology science since high school, influenced from a TV program I watched. So at first I was studying to enter a public university near my house, where I can study psychology. I didn’t go to preparatory school, but I went to cram school once a week since my first year of high school, and worked on mathematics, which was my weak subject. When I was in the third year in high school, I also had one-on-one instruction from my high school teachers. I would go to school early and had one-on-one instruction in mathematics, and afterschool in Social Studies. Learning the technique to visualize and organize information in history studies was especially useful. I still use this technique, and draw pictures and graphs when I study. For the entrance exam of the university I applied, I had to write an essay related to current affairs. As a practice I wrote three essays in a day and asked my Japanese teacher to check my work. I tried my best, but sadly I failed my entrance exam. I was so shocked that I couldn’t think of anything for a while. After I failed, I talked with my teacher about what I should do next. I told my teacher my feelings and what I wanted to learn. Then my teacher suggested the School of Law as another choice. As I was keen to start learning a specialized subject as early as possible, I decided to go on to a vocational college and prepare for transfer admission to the School of Law. I talked with my parents about my future plans too. From April right after finishing high school, I started going to a vocational school in Fukuoka which has a program for transferring to the third year of undergraduate program at university. The school had not only classes for preparing for university transfer admissions but also a curriculum in which students take classes at its partner university and earn credits that meet university entry requirements. This was when my school days attending two schools started. Focusing on the transfer exam for 1year and a half. I got interested in a new area of study. To transfer to the third year of undergraduate program, I had to earn credits in some specific specialized subjects before applying. To this end, I took classes of constitutional law, civil law, and, politics at the partner university. What I became interested in was politics. Political system varies from country to country. I liked thinking about the process, why it differs. When I study I drew figures and simplified the information so that it became easier to understand. This was my style of studying just like I did in high school. The text book of politics. Drawing figures to help better understanding. 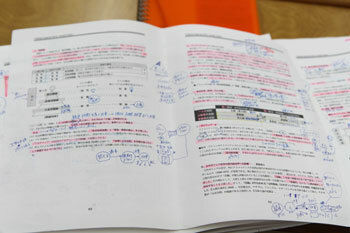 To prepare for transfer admission exam, I solved the past exam problems of each university of my interest. The reason I chose Hiroshima University is that it has the perfect environment for studying not only laws but also other fields as it is an integrated university. I took the transfer admission exam in November when I was a second year student in the vocational school, and passed. In the following April, I transferred to the third year of undergraduate program in the School of Law, Hiroshima University. Another reason I was interested in Hiroshima University was because the university puts much effort in disability aid and accessibility support. I joined the Accessibility Leader Training Program, and took lectures and practical training of disability aid such as guiding technique for the blind and notetaking techniques. After taking the exams, I earned the certificate of Accessibility Leader (Level 1). The classes I especially like are International Law, and Politics. I’m studying world affairs from the Iraq war till now from the legal point of view. It is interesting to look at the society’s movement objectively. Sometimes you might want to run away from studying for the entrance exam. If so, it is important to walk away from your desk for a moment and refresh. If you continue in your own pace, it will lead you to success. Believe in yourself! I’m cheering for you.